Bishop Hall savs, “I wrote a little project of pacification (The Way to Peace in the five busy articles, commonly known by the name of Arminius), wherein I desired to rectify the judgment of men, concerning this misapprehended controversy; shewing them the true parties is in this unseasonable plea; and because bishop Overall went a midway, betwixt the two opinions which he held extreme, and must needs, therefore, somewhat differ from the commonly-received tenet in these points, I gathered out of bishop Overall on the one side, and out of the English divines at Dort on the other, such common propositions concerning these five busy articles, as wherein both of them are fully agreed,” &c. Bishop Hall’s “Hard Measure.” Perhaps, however, bishop Overall’s opinion will appear more clear from what he advanced at the Hampton-court Conference in 1503. As much fault had been found with his university lectures, he now took an opportunity at this Conference to declare before the king: “That whosoever (though being justified) committed any grievous sin, as adultery, murder, treason, or the like, became ipso facto, subject to God’s wrath, or guilty of damnation, quoad præsentem statum, until they repented; adding thereunto, that those which were called and justified according to the purpose of God’s election (howsoever they might and did sometimes fall into grievous sins, and thereby into a state of wrath and damnation, yet) did never fall either totally from all the grace of God, so as to be utterly destitute of all the parts and seed thereof; nor finally from justification. But in time renewed by God’s spirit unto a lively faith and repentance: and so justified from those sins, and the wrath, curse and guilt annexed thereto; wherein they were fallen, and wherein they lay. Which doctrine, he added, some in the university disliked and had opposed: teaching that all such persons as were once truly justified, though after they fell into never so grievous sins, yet remained still just, or in the state of justification; and that before they actually repented of those sins: yet and though they never repented of them through forgetfulness, or sudden death, yet they should be jusified and saved without repentance.” —Strype’s Whitgift, p. 480, &c.
and seems to have paved the way for the reception of that doctrine in England, where it was generally embraced a few years afterwards, chiefly by the authority and influence of archbishop Laud. Overall had a particular friendship with Gerard Vosius and Grotius; and was much grieved to see the love of peace, and the projects of this last great man to obtain it, so ill requited. He laboured heartily himself to compose the differences in Holland, relative to the Quinquarticular controversy; as appears in part by his letters to the two learned correspondents just mentioned, some of which are printed in the “Præstantium et eruditorum virorum epistolæ | ecclesiasticæ et theologicæ,” published by Limborch and Hartsoeker, as an historical defence of Arminianism. But our bishop is known in England chiefly by his “Convocation-Book,” of which Burnet gives the following account: “There was a book drawn up by bishop Overall, four-score years ago, concerning government, in which its being of a divine institution was positively asserted. 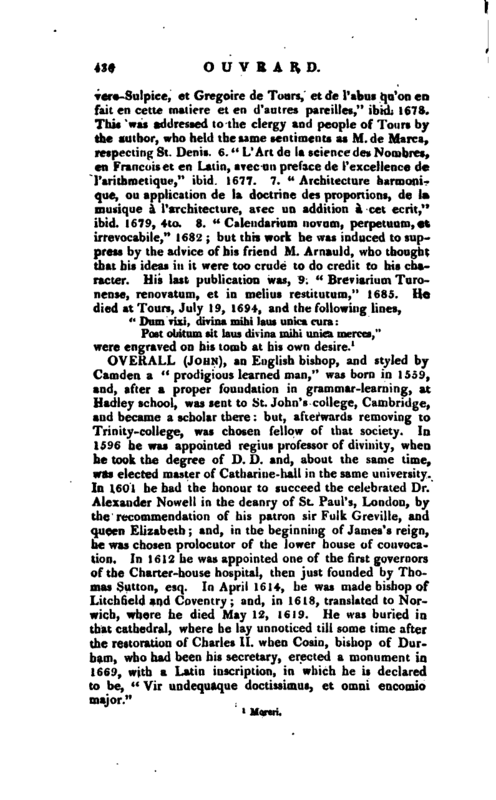 It was read in convocation, and passed by that body, in order to the publishing of it; in opposition to the principles laid down in the famous book of Parsons the Jesuit, published under the name of” Doleman.“But king James did not like a convocation entering into such a theory of politics, so he wrote a long letter to Abbot, who was afterwards archbishop of Canterbury, but was then in the lower-house. By it he desired that no further progress should be made in that matter, and that this book might not be offered to him for his assent; there that matter slept. 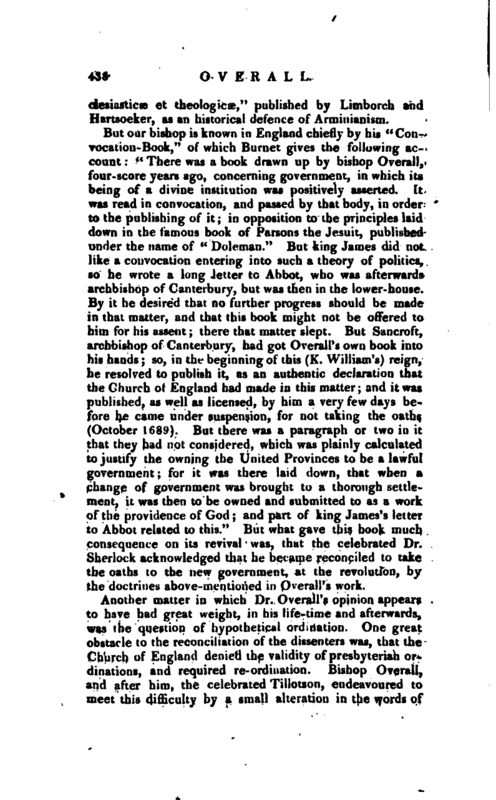 But Sancroft, archbishop of Canterbury, had got Overall’s own book into his hands; so, in the beginning of this (K. William’s) reign, he resolved to publish it, as an authentic declaration that the Church of England had made in this matter; and it was published, as well as licensed, by him a very few days before he came under suspension, for not taking the oaths (October 1689). 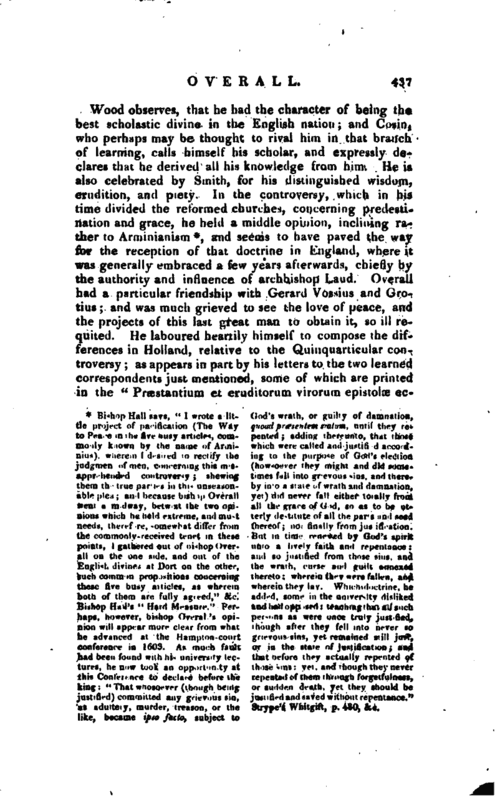 But there was a paragraph or two in it that they had not considered, which was plainly calculated to justify the owning the United Provinces to be a lawful government; for it was there laid down, that when a change of government was brought to a thorough settlement, it was then to be owned and submitted to as a work of the providence of God; and part of king James’s letter to Abbot related to this.” But what gave this book much consequence on its revival was, that the celebrated Dr. Sherlock acknowledged that he became reconciled to take the oaths to the new government, at the revolution, by the doctrines above-mentioned in Overall’s work. Another matter in which Dr. Overall’s opinion appears to have had great weight, in his life-time and afterwards, was the question of hypothetical ordination. One great obstacle to the reconciliation of the dissenters was, that the Church of England denied the validity of presbyterian ordinations, and required re-ordination. Bishop Overall, and after him, the celebrated Tillotson, endeavoured to meet this difficulty by a small alteration in the words of | ordination, as, “If thou beest not already ordained, I ordain thee,” &c.
1 Biog. Brit. art. Sherlock. -Burnet’s Own Times. 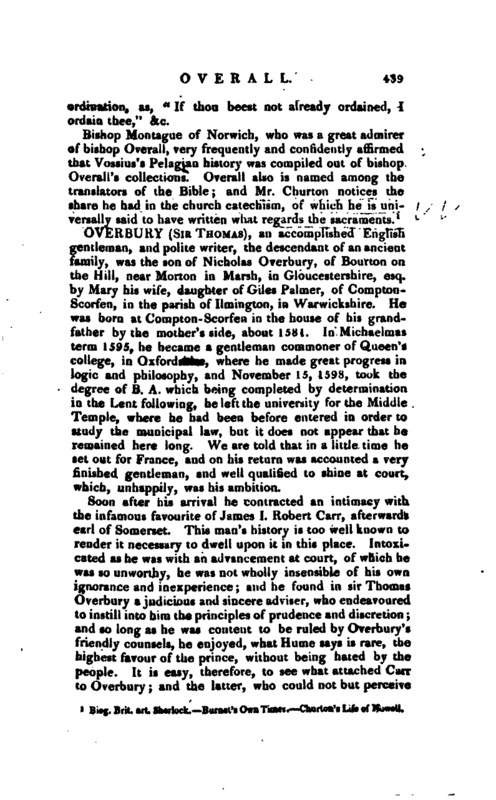 Churton’s Life of Nowell.